The food industry, from how we grow, manufacture, and purchase, to how we consume food, is being disrupted more than ever before. Millennial consumers, who now outnumber boomers and have started their own families, are the main driving force behind these dramatic changes. 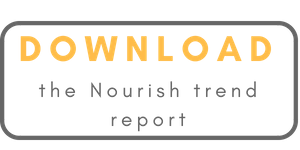 Download the free Nourish Food Trend Report 2018 to learn about the 8 Core Disruptions that will gain momentum in 2018 and how to take advantage of them. I look forward to sharing our insights with you and hope you’ll find them valuable planning for the future of your business. If you’d like to discuss any of the points in detail, just send me a note to [email protected].